this piece is clearly mistitled but contains a little history speckled with hypotheticals and a somewhat misguided utopian conclusion but whatever i posted it for the overall lol it gave me. Every kid in America could have a free public college education right now if George W. Bush hadn't been such a war monger. 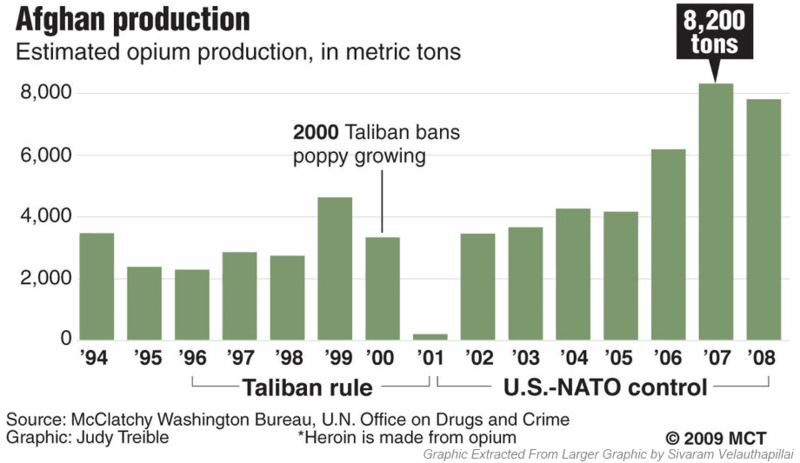 In 2000, roughly 4,500 metric tons of opium was produced in Afghanistan. In 2001, that number plummeted to less than 1,000 metric tons. The price of heroin went up around the world, and the number of addicts – particularly in Europe, Russia, and America – dropped. The Bush administration was so impressed by the decrease in opium production that it gave $43 million to the Taliban, to encourage a continued halt on opium production. While $43 million may not seem like a lot, it's important to put it in context. At the time of the deal, Afghanistan's total GDP was just $2 billion, putting it at the bottom of the global GDP rankings. It was, literally, the poorest country in the world. So, for the Taliban, $43 million was a lot of money. George W. Bush's decision to fork over $43 million to the Taliban to help curb drug trafficking, use, and abuse was actually a good choice, and a smart policy. Now fast forward to the days and weeks after 9/11. On October 14th, 2001, a senior Taliban leader, Deputy Prime Minister Haji Abdul Kabir, sent an official offer to Washington, saying that the Taliban would be willing to hand over Osama Bin Laden to a third-party country, if the U.S. stopped the bombing of Afghanistan. Kabir said that, "If America were to step back from the current policy, then we could negotiate. Then we could discuss which third country." But Bush, the same man who, just months earlier, had handed over a small fortune to the Taliban government, rejected this latest offer of cooperation. Instead, he took up a "scorched earth" policy and bombed Afghanistan back into the stone ages. Bush's decision to invade Afghanistan has cost our country over $713 billion since 2001. And that number is rising by the millisecond. In fact, every hour, the war in Afghanistan is costing We the People another $10.17 million. The Taliban offered to hand over bin Laden on a silver platter, but we said no, and now it's cost us hundreds of billions of dollars. But what if George W. Bush had taken up the offer from the Taliban, and even sweetened the deal like he did with the opium? What if he did something similar to what he had done just months before, and offered to give the Taliban money, if they promised to cut down on terrorism and on al Qaeda's presence and influence in that nation? We could have given the Taliban $2 billion, enough to double the nation's GDP and make everybody in the country twice as wealthy, and it still would have only been a drop in the bucket compared to what we've spent on the war in Afghanistan. And, if we had done that, we would have saved ourselves enough money to provide a free public college education to every single eligible student in America. As The Atlantic points out, according to Department of Education data, public colleges across America collected $62.6 billion in tuition from undergrads in 2012. That means that the federal government would only have had to spend $62.6 billion to help make public college tuition free for every student in America in 2012. That's less than 11% of what we have spent on the war in Afghanistan. The bottom-line here is that George W. Bush had a chance to get America's priorities right, and he failed. Fortunately, he's not in Washington anymore. So now, instead of spending trillions of dollars on prolonging the Bush legacy of unjust wars, we should be spending those trillions on the things that will make America great again, like giving every eligible student in America a free public college education. They are actually reinstating the payment policy to farmers not to grow opium. Heroine prices are low and abuse is high because of the availability and it's much cheaper than prescription painkillers. I'm afraid we're caught in a vicious cycle. I thought this was about the GWB from NJ to NYC (George Washington Bridge). I'll be back to read the article. We could have had a free college education.. but we wouldn't have. Just like healthcare, education in this country is a business. We will never have free education. Even BEFORE GWB we'd NEVER get free education or healthcare. Too much greed and fucced up priorities in this country for that to even begin to happen.